Rock - The material that makes up the solid parts of the Earth. Can be made of minerals, solid organic matter, or noncrystalline solids (i.e. - glass). Classified by how it forms. Igneous - "Coming from Fire"
Formed as magma/lava cools and hardens. Magma - molten rock below the Earth's surface. Lava - molten rock on the Earth's surface. Sedimentary - "Made of Sediments"
Formed as sediments are compressed and cemented together. Sediments - broken up bits of rock, minerals, and organic matter that has been deposited by wind/water/ice. Metamorphic - "Changed in Form"
Formed from igneous/sedimentary rock that has been changed by heat/pressure/chemical processes. A series of processes in which rock forms, changes from one type to another, is destroyed, and forms again by geological processes. Igneous rock forms from magma/lava. Rock can be broken into sediments, which form sedimentary rock. Rock can be changed by heat/pressure into metamorphic rock. Rock can melt into magma, then cool into igneous rock. Any type of rock can form into any other type - they do not always follow the same path on the cycle. Physical and chemical properties are determined by how/where the rock formed. Physical properties reflect the chemical composition of both the whole rock and the individual mineral components. The chemical stability of the minerals determine the rate of weathering of the rock. Weathering - natural processes which break down rock physically and chemically. Shows the order in which minerals crystallize from cooling magma according to their chemical composition and melting point. Note: Melting point and freezing point are the same point - you just approach it from different directions! As magma cools, certain elements crystallize first, which removes certain elements from the magma. This changes the magma's composition. Changes in the composition of the magma allow different minerals to form. Different minerals form at different times in the process, but generally in the same order! Two graphics of Bowman's reaction series to aid in understanding. Please look at them both! These show the order that minerals form as magma cools. All of these are forming from the same batch of magma, to make a rock that contains all of these minerals. The tendency of a chemical compound to maintain its composition (to resist breaking down into another substance). Minerals formed at highest temperatures tend to be least stable. All rocks have zones of weakness, determined by how/where they form. Sedimentary rocks may break between layers of their component sediments. Metamorphic rocks may break in layers formed from aligned minerals. Igneous rocks tend to have evenly spaced zones of weakness (joints) that form as the rock cools and contracts. Inside the Earth, rock is under great pressure. When lifted to the surface, decreased pressure allows joints/fractures to open. Once weaknesses are exposed to air/water, physical and chemical weathering can begin to break down the rock. Igneous Rock forms when magma cools and hardens. Most is crystalline, as crystals usually form as magma solidifies. When temperatures rise above the melting point of the minerals in the rock. Adding water to hot rocks can lower the melting point. Partial melting occurs when different minerals melt at different temperatures. This changes the composition of the magma over the melting process. As more minerals melt, more elements are added to the magma. Minerals with highest freezing points form first. This removes certain chemicals from the magma, changing its composition. Earliest crystals to form tend to be largest; they have the most time to grow. Sometimes, the center of the crystal has different composition from outside (because the magma's composition changes). Intrusive Igneous Rock - Forms from magma beneath the surface. Extrusive Igneous Rock - Forms from lava at the surface. Typically intrusive rock with large mineral crystals. Magma cools slowly, crystals have more growing time. 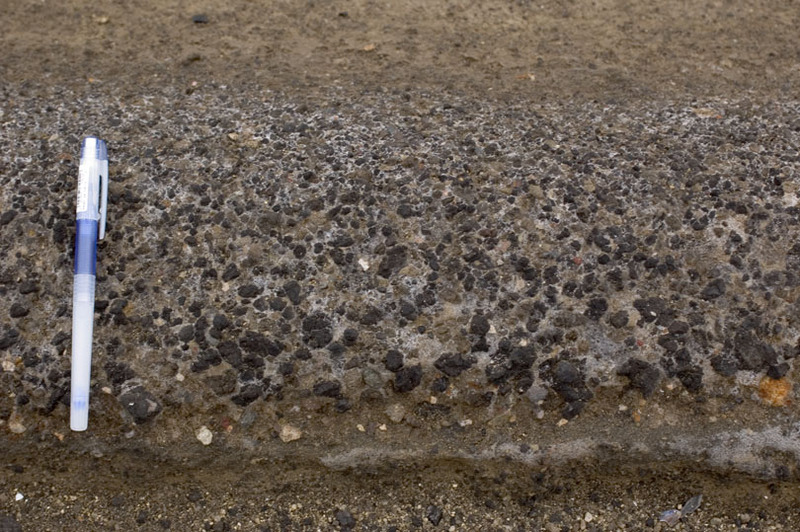 Typically extrusive rock with small mineral grains (cannot be seen by unaided eye). Magma cools rapidly, crystals don't have time to grow large. Mixture of large and small crystals (large crystals embedded in a matrix of small grains). Formed as magma rises towards the surface - cools slow initially, faster as it approaches surface. Formed when viscous magma cools quickly, so no crystals can grow. Formed when quickly cooling magma contains a lot of dissolved gas, which creates bubbles (vesicles). Igneous rock masses that form underground (intrusions) by entering other rock masses and cooling. Batholiths - large intrusive formations spreading over 100 km2 at the surface. Stock - similar to batholiths, but cover less than 100 km2 at the surface. Laccolith - formed when magma pushes between two layers, pushing the overlying rock up into a dome shape. Sill - formed when magma flows between rock layers and hardens. Dike - formed when magma cuts across rock layers and hardens. Igneous rock masses that form on the surface (extrusions) by volcanic activity. Volcano - a vent through which magma, gases or volcanic ash is expelled. Volcanic Neck - magma in the volcano's vent hardens, then the softer outer rock erodes away; this leaves the hardened vent. Lava Flows - flat masses of rock formed when lava cools and hardens. Lava Plateau - a series of lava flows that cover a large area with thick rock. Tuff - formed from volcanic ash and particles; can form deposits hundreds of meters thick and hundreds of kilometers across. Loose fragments of rock, minerals and organic material. Generally transported by wind, water or ice. Can be physically changed or chemically altered during transport. Compaction - sediment is squeezed by weight of overlying layers, reducing volume and porosity. Cementation - sediments are glued together by minerals deposited by water. Forms when dissolved or suspended minerals precipitate out of solution. Often happens when water evaporates. Evaporites - rocks formed from minerals left behind by evaporating water. Formed from the remains of living things. Coal - plant remains buried before they decay, compressed into carbon-rich minerals. Formed from rock fragments that are deposited, cemented and compacted. Often porous, allowing groundwater, natural gas, and crude oil to flow through. Usually compressed into flat layers that can be split apart. Physical characteristics of sediments are mainly determined by how they are transported. The speed of transport determines the size of the particles moved and the distance they are moved. Sorting - The tendency of water or wind to separate sediments according to their size. Faster current can carry larger particles. As the current slows, larger sediments are dropped off first. Angularity refers to the shape/texture of the sediments. Newly broken sediments tend to be angular. The longer/farther they travel, the smoother they tend to become. Different environments have different characteristics and create different structures. Stratification - Layering of sedimentary rock. Occurs when the conditions of deposition change (creating differing layers). Beds - stratified layers of rock. Vary in thickness due to the rate and duration of deposit. Massive Beds - beds with no internal structure (no layers in them). Usually more than 10cm thick. Formed when similar sediments deposited under similar conditions over long periods of time OR large amounts deposited at one time. Cross-Beds - Beds that contain slanting layers. Usually form in sand dunes and river beds. Reverse Grading - When the largest sediments are on the top, smallest on the bottom. Can be formed under specific conditions, such as mudflows. Ripple Marks - Caused by the action of wind/water on sand. Ripple marks in rock indicate a beach or river bed. Mud Cracks - Formed when muddy deposits shrink as they dry. Flooding may fill in the cracks with other minerals. Concretions - A lump of rock within the bed that has a different composition. Formed when minerals precipitate out of groundwater around a nucleus. Geode - Formed when water deposits minerals inside cavities in sedimentary rock. Metamorphism - The process by which one type of rock changes into metamorphic rock due to heat, pressure, and/or chemical processes. The type of metamorphic rock indicates the conditions present at the time the rock was changed. occurs when existing rocks come into contact with magma. only a small area, surrounding the magma, is changed. occurs as a result of tectonic activity (such as when mountains are formed). since volcanoes may occur during tectonic activity, contact metamorphism can occur in areas of regional metamorphism. Foliation - metamorphic rock texture in which mineral grains are arranged in planes/bands. extreme pressure causes mineral crystals to realign/regrow in parallel bands. minerals of different compositions separate to form alternating light and dark bands. Slate - Comes from shale, layers of clay grains pressed into thin layers. Schist - Formed when large amounts of heat and pressure are applied to slate. Gneiss - Formed when the minerals in schist separate to form light and dark bands. Nonfoliated - metamorphic rock texture in which mineral grains are not arranged in planes/bands. original rock may contain only one mineral (or very little of other minerals). original rock may contain grains that are round/square, and do not change position when compressed. Quartzite - Formed when quartz sandstone is compressed. Marble - Formed when limestone is compressed. Igneous Rocks, Part 1 (14:18) and Part 2 (12:30)- Lectures from an online class. Sedimentary Rocks, Part 1 (14:07) and Part 2 (7:10) - Lectures from an online class. Metamorphic Rocks, Part 1 (13:54) and Part 2 (8:27) - Lectures from an online class. Bowen's Reaction Series (15:55) - Great explanation of this concept! Crystallization Visualization (2:39) - No sound, just animation of how solids crystallize at the molecular level. Formed This Way (4:25) - Fast-paced song, covering the three rock types, based on "Born This Way" by Lady Gaga. Lyrics here.